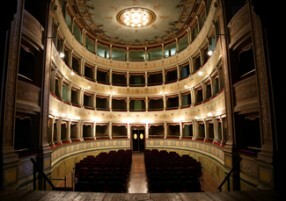 The Teatro Sociale di Amelia (Rosita Bassini) represents one of the most important cultural centers of the town. At the time of its construction, around the end of 700, we felt the need to create a view of cultural exchange and recreational interest in the fulfillment of a common roof able to put together the Ceto Noble with the Civic. The design and construction management was entrusted to Stephen Consacchi, a renowned architect of the time, a member of the Academy of Design in Perugia, which was also part of Gian Antonio Selva, the future creator of the Fenice in Venice. The theater Amelia refers to the latter, in fact, for architecture and decorative elements. Over time, the theater was the subject of restoration and improvement to become what it is today, a wooden structure by mechanisms fully functional stage, reminiscent of representations of the greatest works of the Italian repertoire, film set of famous movies such as The Marquis of the Cricket, Pinocchio and with Alberto Sordi, Nino Manfredi and future container with more expressions of theatrical art.